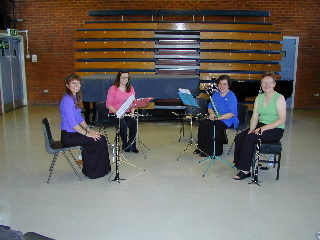 The Serenata Clarinet Quartet was formed in January 2005 as part of a proposition module for my music degree. We all enjoyed playing as a quartet so much that we decided to continue. The quartet is named after a favourite piece of clarinet music of mine - 'Serenata' by Ernesto Cavallini. I am trying to collect everything he ever wrote - a difficult task. 26th May 2005: Our Spring Concert in the Recital Room in the Orangery at Trent Park, Middlesex University where we premiered two new works written especially for us: 'Eyes' by Northern Irish Composer Roma Cafolla and 'Waters Meet' by our own member Katie Butler who has just completed her BA Mus (Hons) in composition at Middlesex University. 10th July 2005: London Chamber Group Contemporary Music Party, The George Inn, London. We played another new piece written especially for this concert by Katie titled 'Motion Picture'. We are gradually building up an extensive repertoire library with focus on music specifically composed for clarinet quartets. We are available weekends and weekday evenings for all occasions and are based in the North London, Hertfordshire area. We have a varied repertoire as can be seen on this site, which we hope include pieces known and liked by all. We aim to be as accommodating as possible in your choice of music programme and are happy to discuss your requirements. Okay so it is not the best picture - but here we are from left to right. Lorraine, Katie, Sue and Chris. Copyright © 2005 by Lorraine Tyler. All rights reserved. This page was last updated on Tuesday, 27 June 2006.